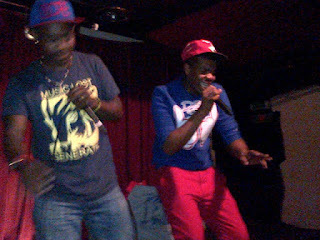 Platinum lounge was on fire on Friday evening as the V2V crew held another well organized show. The line up was eye catching to any hip hop head in Cape Town and it also served as another opportunity for cats to network. The performances were all dope but one would say the line up was a bit too long for a night show but nun the less dope performances. On a critic's point of view you'd feel that most artist are over using international crunk beats and adopting the international styles of rap wich is not a very wise thing to do for a underground cat. On a good note the cats and groups did not disappoint, we heard the best of V2V , backyard, SIM, NUFFSAID, 300 years , phoenix and many more blessed us on the mic. I felt blessed as REZ and his sister graced us with their dope, conscious and yet humble performance. The show all in all was for the video of Deezat, one of the artists from V2V. I had a chance to speak to him and he told us that this was the first scene to be shot from his up an coming video for his yet to be released mix tape. He also told us that there is a second video coming for his unreleased mix tape. Now that's what you call hustle. All in all everyone had a good time including the artist who some of them went home having learned something new.